What a difference it makes to have a shortened day on the road. Just lovely. I left the pretty wayside lake just after 7:30 in the morning and pulled into Liard Hot Springs at around 3pm having stopped off in Watson Lake for a couple of hours in the middle. 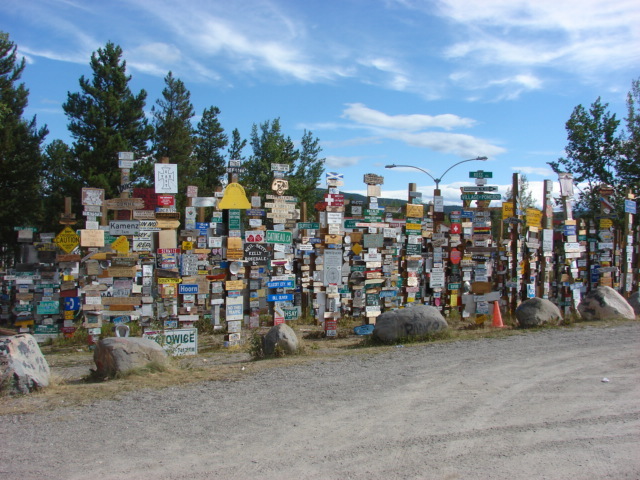 While in Watson Lake I visited the famous Sign Post Forest which now consists of over 6,700 signs and was started by a US Army soldier who was here building the Alcan Hwy back in 1942 and it has grown from there. I also walked the dogs, visited the visitor’s center/museum, got gas, and poached somebody’s wireless internet and had a fine time all round. Below is just a section of the Sign Post Forest. A friend suggested ahead of time that I make a sign to hang when I got here, but I neglected to do so. Wish I had. It would have been fun. There are signs from all over the world. 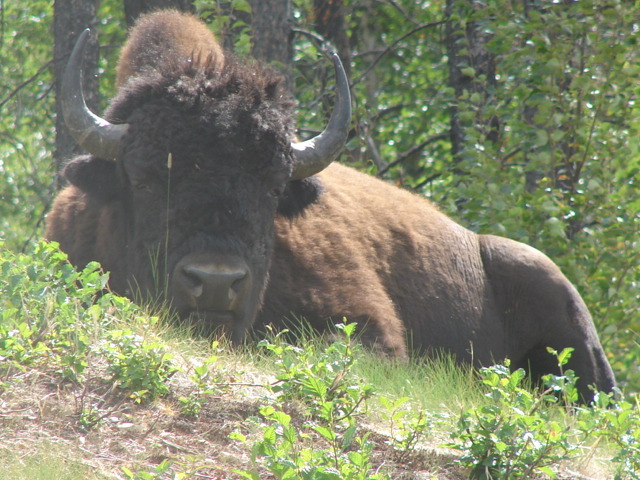 Wildlife on the Alcan is abundant. 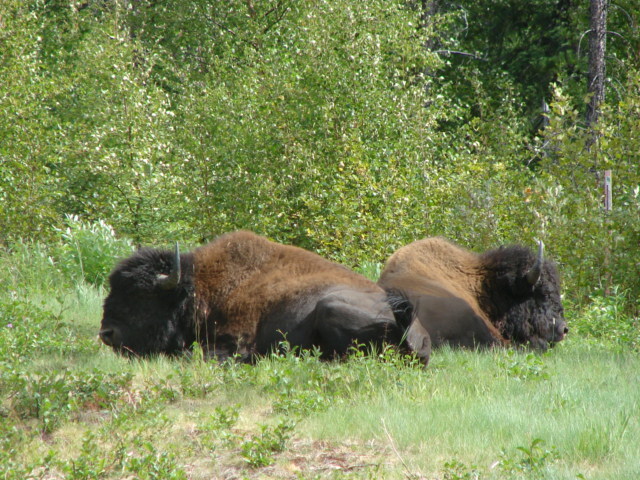 Brown and black bear, elk, sheep, caribou, and moose represent the larger species frequently seen. Some friends drove this route in early May and had 14 bear sightings along with multiple sightings of all the others. So, I’m back on the road after leaving Watson Lake lamenting my bad luck in the animal sighting department. I mean, I had driven almost a thousand miles at this point and all I had to show for it was a pair of Trumpeter Swans, about 900 Ravens, and a Magpie. Pitiful, but wait…what’s that up ahead??? It’s big and brown….no, it’s huge and brown….could it be? Yes! It’s a pair of Buffalo. Who knew? And a close up of one of the handsome devils. And then an entire herd. Apparently they were reintroduced a good many years ago and have thrived. They wander wild all over the place, including the highway. After dodging the bison, I made my way to the much anticipated Liard River Hot Springs, which has been a favored stop along the highway and prior to that was a favored spot among the native people. 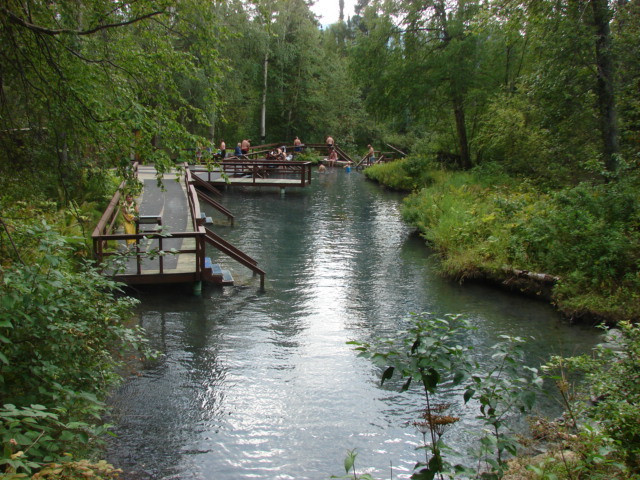 The hot springs are in a natural setting and are accessible by about a 10 minute walk over a boardwalk and through a boreal forest. The water temps range from 108-126 degrees. How delightful it was to soak away the low back, neck, and shoulder pains from resulting from extended driving. 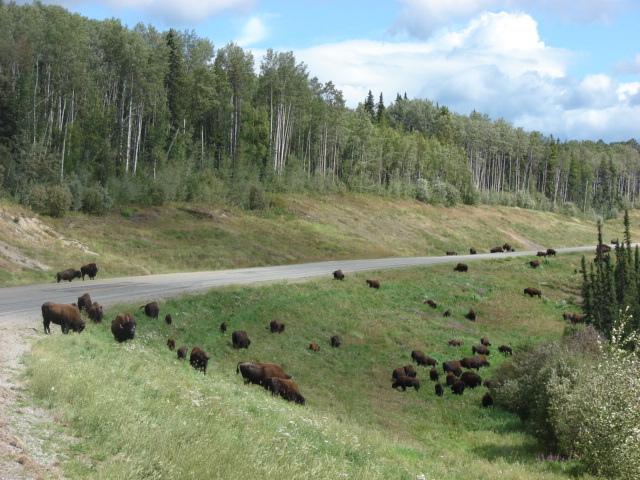 Oh, and on the way back to Dora, I had to dodge two more buffalo who were ambling around her front yard. Lovin’ the posts Margie! Drive careful! Loving your logs and pictures! Those Buffalo sure are big! Sounds like this was an awesome day! And I don’t see any rain – must not be in Anchorage any more! Your pictures are unbelievable; I almost feel like I’m there! How wonderful! Brings back some memories. I can’t wait to hit the road again.